Your new movie Love Me Not - in a few words, what is it about? 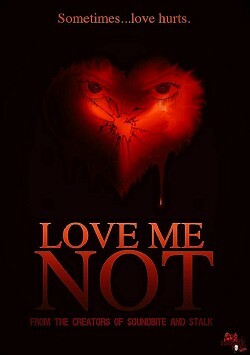 Love Me Not is a story about betrayal and revenge. It captures deep love emotions with a horrific twist. Now how did the project come into being in the first place? And to what extent could you identify with the film's horror theme? The project came from the mind of our amazing writer Brantley Brown [Brantley J. Brown interview - click here]. The central theme of this film to me is love. With all that's going on in this social media age. We forget the key component to life is love. Our technology has turned us into semi robots in the sense that we have become emotionless and we forgot that love is why we are here. And we will kill whoever goes against it. Figuratively or course. What were the challenges of bringing Love Me Not to the screen from a producer's point of view? The main challenge is keeping things within budget while still satisfying your creative team. In my case I am lucky that my director Micheal Coulombe [Michael Coulombe interview - click here] and scribe Brantley Brown are willing to sacrifice in order for this dream of Horror House to work. So in that case I'm grateful to have a team that's willing to sacrifice and put in the hard work in order to make critically acclaimed time pieces. How hands-on or hands-off have you been during the shoot as a producer? I'm more a hands off producer. I let my team handle the creative side while I handle the logistics of the filmmaking process. What was working with Love Me Not's writer Brantley J. Brown [Brantley J. Brown interview - click here] and director Michael Coulombe [Michael Coulombe interview - click here] like? And since this wasn't your first collaboration, what can you tell us about your previous films, and how have the three of you first met even? Well my team is amazing. I can't say it enough. The patience and understanding they have for our projects and the amount of work they put in day in day out I greatly appreciate, especially because I'm putting my hard earned money into our dreams. I really can't say enough how proud I am of them and how excited I am for our future endeavors. Our previous films were also hits in my eyes. Soundbite was more psychological thriller and it gave our audience a splash of the quality and creativity we will explore through our Horror House brand. Stalk was an edge-of-your-seat horror that had a surprising twist at the end that I was incredibly proud of along with a empowering message for women. As producer, to what extent were you involved in the casting process, and what can you tell us about Love Me Not's cast? I leave our casting decisions in the hands of Mike and Brantley because they are the ones who have to help talent bring out those characters they envision, and as for all of our cast from all our films I'm probably the most proud because I'm big on diversity and inclusion so we have been able to stay consistent with that theme for our creative projects. On-set atmosphere was magical. A creative incubator I like to call it when I'm on set because taking words and bringing them to life is a experience that can only be felt when you're on a set and it really does feel like a magical experience to me. The $64 question of course, where can Love Me Not be seen? Love Me Not can be stream now on YoutTube on the Horror House Media channel and also on the Amazon Fire TV. We will also be streaming soon on Roku. What got you into producing in the first place, and did you receive formal training on the subject? Film/TV is a family business for me. My cousin Bentley Kyle Evans, producer/showrunner for big 90s hits like Martin and The Jamie Foxx Show, as well as my cousin Stacey Evans Morgan, writer and producer for shows like The Parkers and Moesha, have taught me and mentored me in this business. Jerry Bruckheimer, Tyler Perry, Michael Bay, Will Packer. Bad Boys 1 and 2. Friday. Gone in Sixty Seconds.